This wasn’t meant to be a glamorous trip. There would be no ice driving nor desert off-roading. I was about to embark on a 300-mile trip to the frigid Northland and I needed a nice pack mule to haul all my junk up there with. And the 2017 Volvo V90 Cross Country proved to be a damn fine vehicle to do it with. 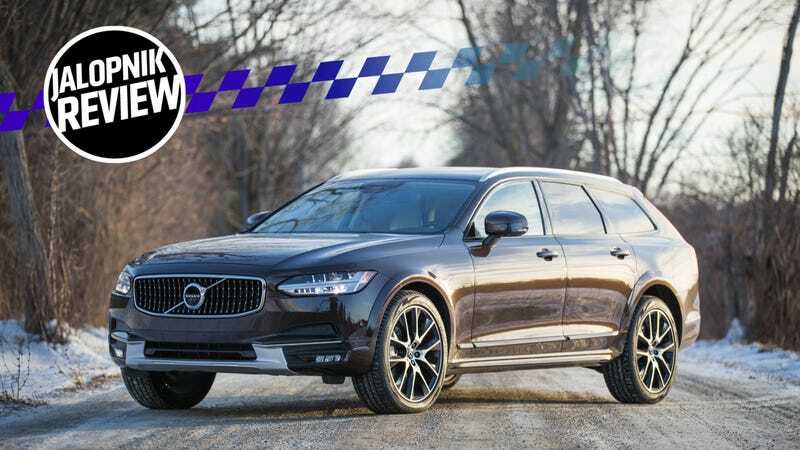 If you aren’t yet familiar with the Volvo V90 Cross Country, it’s the lifted version of the V90 wagon—it gets a mighty 8.3 inches of ground clearance as opposed to just six. You can get it with two engine options, the T5 or the T6, which are turbocharged or super- and turbocharged 2.0-liter four-bangers, respectively. The T6 has a slightly bigger turbo and better performance. They come with all-wheel drive and an eight-speed automatic gearbox. The V90 that Volvo gave me was the T6, which meant that it had 316 horsepower and 295 lb-ft of torque. It also had a $3,200 Bowers and Wilkins sound system, the Luxury Package (which included heated and air-conditioned massage front seats), the Convenience Package (which included a grocery bag holder in the trunk), 20-inch alloy wheels, a heads-up display and air suspension in the rear. And it wore a sparkly coat of brown metallic paint. As I noted in my first drive from a year ago, I found the engine to be very firmly Fine, if not also utterly unremarkable. The steering was artificial, floaty and vague, even after putting the car in Dynamic Mode. All of these things still held true. But, good lord, does the car make you excited to go on what would otherwise be wholly mundane trips. Hands down, this Volvo had the most comfortable seats I’ve ever experienced in a car. I drove around in it for over 700 miles and had nary a complaint. The sun was out, and the glass sunroof that extended all the way to the back seats just let in so much light. Driving this thing is such a bright and happy experience. Stepping into the V90 is like sliding into a chrysalis of opulence, from whence you emerge newly enlightened with what passes for a good car interior. You know how other cars beep rudely at you when you do something they don’t like? The Volvo is too classy for that; it emits honeyed trills. Brash and square air vents? No, the Volvo had long, vertical air slits tipped with what looked like brushed aluminum (I have no idea if it was actually aluminum). Stop/start the engine with a button? Please, have this clear, plastic-encased toggle instead. Rear view mirrors with bezels just seem tacky to me now. Who knew? The leathers were soft and creamy to the touch, and we found plenty of little nooks and crannies for our things. The grocery bag holder folded into the trunk was great for loose grocery items. The cavernous trunk itself, easily fit all of our luggage with room to spare. Ample legroom for the back seat passengers only added to the utility of this wagon. Temperatures hovered around zero over the course of the week that I spent in Vermont, but as it turned out, the Volvo was excellent on cold starts and heated the cabin very quickly. It’s an infinitely cozy feeling to be trundling around on snowy roads while sitting in a toasty wagon. And if you live in a cold place, definitely check the box for the heated steering wheel. It makes all the difference. It has 54 cubic feet of trunk space with the rear seats folded down and 26 cubic feet with the rear seats up. Comparatively, a BMW 5 Series sedan only has 18.7 cubic feet with its seats up. That right there is the No. 1 benefit of a wagon over a sedan! In fact, the only problem I had with the car was the massive touch screen that controlled most of the car’s functions. The V90 only had one dial, and that was for managing the radio volume. If you wanted to change anything else—the radio station, locate the nav, alter the car’s driving dynamics, access the climate control—you had to do it through the touch screen. Which is fine... if you’re a passenger. But when you are driving and can’t look down for extended periods of time, this can be a bit of a problem. If I wanted to change the temperature of the climate control, I had to use a slider on the touch screen; not a particularly precise system. In an email, a Volvo spokesperson clarified that you can change the car’s settings for radio, temperature, phone, etc. through buttons on the steering wheel or via voice control. The V90 also came with Pilot Assist, Volvo’s semi-autonomous function. The car has “eyes” that “see” the road from a big sensor behind the rear view mirror and gives you a visual indicator of when it has enough information to activate Pilot Assist. Once you do, the car will steer itself to stay in lane and use its adaptive cruise control to maintain a set speed and following distance behind other cars. You have to keep your hands on the wheel, though. If you remove them, the system will sense that and trill for you to put them back. This was fun for a while, but also very spooky: you’d feel a light, ghostly pressure turning the wheel beneath your fingers. Yet, sometimes it would fail to spot where the opposite lane began and lazily try to steer us into oncoming traffic around turns. I really needed to stay on top of the system. Frustratingly, there were no audible notifications when the car’s sensors could no longer see where the lane markers were and disengaged Pilot Assist. The little steering wheel icon on the dashboard, green for when the car could see, would turn gray when it couldn’t, and that was the only heads up you got. More often than not, I was made aware that Pilot Assist had shut off when the car just didn’t steer when it approached a bend. Pilot Assist doesn’t feel finished. When it works, it works fine, but I always felt like it needed perfect conditions to do so, and expecting many of America’s roads to be like that seems idealistic. I think I’d prefer a system that worked 100 percent of the time rather than a system I had to chaperone. My official recommendation? Use Pilot Assist on the highways only, where the road is less curvy and there’s less oncoming traffic. I don’t predict many owners will use it more often than that. Which is totally fine, because it’s not that V90 Cross Country’s main selling point. The appeal of this wagon lies in its sheer wagonishness and its beautiful style. Even covered in five days’ worth of Vermont salt and slushy road grime, the ca easily stood out in a crowd of SUVs and crossovers. Among other 2017 and 2018 models, it still looks years ahead of its time. Hardly any automakers offer wagons these days, in part, I think, because wagons were seen as the “mom cars” of the ’80's and ’90's. The SUV craze is just a response from people wanting to move away from that image. Which means if you buy a wagon, you’re making the conscious choice to be different. 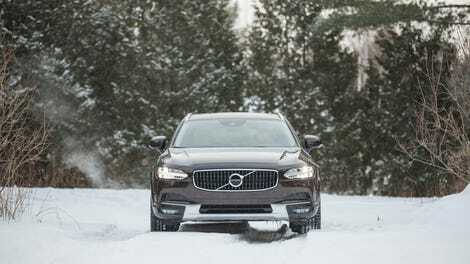 The V90 Cross Country is a cool damn wagon, with fashionable lines and a striking design. Pulling out of a highway rest stop, I got the nod of approval from a woman crossing the parking lot. Drivers passing by in town gazed at it from their vehicles. It catches attention, but not the same attention you get if you’re behind the wheel of a Lexus LC 500 or a Fiat 124 Spider Abarth. Because of the showy nature of those cars, the attention isn’t always positive. But handsome Volvo wagon? This is not a car that everyone notices, but when they do, it’s hardly ever bad. The general air it feeds off of feels appreciative. I can almost guarantee you that no SUV can do that. It’s not the most engaging car in the world to drive, but it makes you look and feel classy as hell when you do. There’s no getting around it: the V90 Cross Country, especially one loaded up like my test model was, is not cheap. The base model starts at $52,300 and mine, as tested, came to $69,440. By comparison, a 2018 Buick Regal TourX starts at $35,495, though I personally haven’t driven one of those yet. The people buying this car have some extra money lying around, so they have the luxury of choosing something more expensive and chic as their personal chariot. They don’t care so much about how the car drives, but they want the utility and appreciate a very nice interior. They recognize that SUVs are excessive and that a station wagon will cut it. In my first drive of the car, I only got to spend about 90 minutes with it, half an hour of which was spent sliding it around on a frozen lake. The majority of car owners will never do this in their cars, so while the test was fun, it was kind of pointless. All I learned that day was that the chassis was tuned to be more neutral than understeer-y. But in the week that I spent with the V90 Cross Country, I found that it, like its S90 cousin, is brilliant at just being a car. It doesn’t make you want to seek out the twisty back roads and you won’t win any highway races in it, but it’ll keep you safe and you’ll be happy to see it in your driveway or in the parking lot because it’s pretty. Sometimes there isn’t any more to it than that. Clarification Jan. 31 2:16 p.m. EST: A Volvo spokesperson reached out to clarify that the car’s interior controls aren’t only accessed through the touch screen, but through buttons on the steering wheel and voice command as well. This post has been updated to reflect that.